Give your fine, lifeless hair a volume injection with Aveda Pure Abundance Volumizing Shampoo. Its plant-based formula will ensure that your fine hair will be left boasting incredible fullness and natural body. Its plant-based formula boosted by certified organic acacia gum combined with aromas of certified organic peppermint, ylang ylang, palmarosa and jasmine will add body and volume to your fine hair. 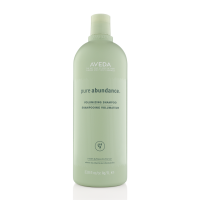 Aveda Pure Abundance Volumizing Shampoo will leave your locks feeling full and fabulous. Massage shampoo into your wet hair.